Enlarged Organ. Eliot Church, Newton, Mass. 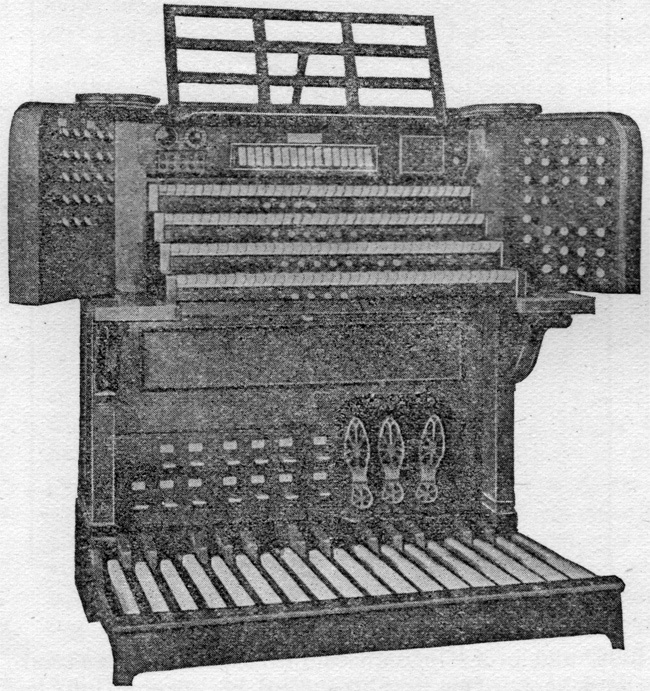 While a glance at the specifications of this organ will show the composition of the instrument, a few words of general description may add interest and give a more complete idea of its unique system of mechanical accessories, etc. The amount of electrical current required is one-twentieth of an ampère at a pressure of eight volts for each key and is derived from a four-cell storage battery which is constantly being charged by a primary battery of twenty-four cells. A dry battery of six cells serves as a reserve and can be switched in by the organist at the console any moment should occasion require it. One specially unique feature of this instrument is the double system of combination movements. Fifteen adjustable piston combinations operated by push-buttons placed below their respective manuals, and fourteen combination pedals (with fixed combinations) which lock down, each thus serving both to bring on and to throw off its combination, gives, with the grand crescendo, thirty distinct combination movements. The adjustable pistons can be “set” to any combination of stops at the will of the organist, and can be changed as often as desired by means of thumb-buttons on a recorder just inside the door of the organ. The echo organ, which is placed in a special gallery with accommodations for twelve singers, is the largest in New England and contains twelve stops, all but two being placed in a swell-box. The open diapason is outside on a separate chest to give greater power for antiphonal effects, and the carillons are on top of the swell-box, thus giving the effect of chimes in the tower. The only connection between the main organ and the echo organ is the cable 240 feet long, containing 400 wires, and the nine-inch iron conductor which conveys the wind from the feeders to the reservoir of the echo organ. A large independent blowing plant consisting of vertical square feeders operated by a water motor, placed in the basement, supplies the wind to all the reservoirs of the organ. The console is provided with a set of indicators for the combination pistons, a second set for the combination pedals, an eclipse wind indicator, a graduated eclipse indicator for the grand crescendo, a two-candlepower electric lamp for wedding signal, a switch for the reserve battery, and a clock. The pedal board is level, with parallel pedals. You are reading Enlarged Organ. Eliot Church, Newton, Mass. from the December, 1903 issue of The Etude Magazine. Recital Programs is the next entry in The Etude.